ID#:4843 This micrograph depicts an egg from a Schistosoma haematobium trematode parasite; magnified 500x. Note the egg's posteriorly-protruding, terminal spine, unlike the spinal remnant, which protrudes from the lateral wall of the Schistosoma japonicum egg. 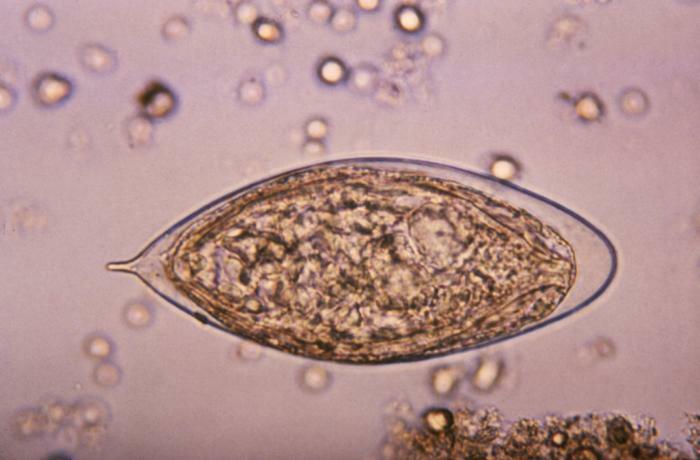 These eggs are eliminated in an infected human's feces or urine, and under optimal conditions in a watery environment, the eggs hatch and release "miracidia", which then penetrate a specific snail intermediate host. Once inside the host, the S. haematobium parasite passes through two developmental generations of sporocysts, and are released by the snail into its environment as "cercariae".